For over 35 years, Hearthstone has been renowned for its hand-crafted soapstone and cast iron stoves. The Heritage Pellet Hearthstone stove is built of stone and cast iron. Generally, pellet stoves are not attractive, they are more about function. Hearthstone changed that with this stove and they engineered a well-built, aesthetically beautiful stove. Onboard Computer - The Heritage is equipped with a sophisticated room sensor. Set the temperature you want to and the stove automatically modulates its burn rate, feeding in pellets as needed to keep the room at the temperature you set. The Heritage also has a 7-day programmable times, with two ons and two offs per day. This means you don't have to constantly fuel your stove, and your home will be warm when you need it most. The Heritage also has one of the quietest blowers in the industry. The stove also has a pretty flame. Rather than the typical pellet stove torch-like flame, the Heritage has an oblong, football-shaped burn pot which allows the flame to spread out, so it looks prettier, more natural. The Heritage Pellet has the best range of heat outputs in the market – as low as 15,300 BTUs and as high as 52,000 BTUs. It has the capability to heat up to 2,000 square feet. It’s also one of the cleanest burning pellet stoves, with an EPA emission rating of 1.3 grams/hour. The Heritage is 86% energy-efficient, one of the most efficient pellet stoves in the industry. 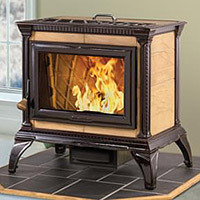 The Fireplace Shop and Grill Center at West Sport in Sudbury, MA offers everything hearth, grill and outdoor living related for your home including Hearthstone Gas Stoves and Hearthstone Wood Stoves. West Sport gas fireplace inserts have been installed in Framingham, Natick, Lexington, Newton, Wellesley, and other towns in Massachusetts.